"Underbelly Croc stares at you hungrily as he licks his chops." I could imagine him eatting a large sewer rat or the occassional stupid adventurer who's not paying attention. This mob reminds me of the 1980 movie Alligator. 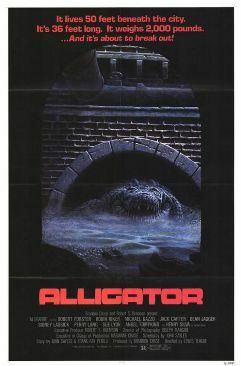 The movie poster is reminiscent of the croc itself. Infused Mushroom Meatloaf? Awesome! This is one of the easiest cooking dailies! When you use the traveler's tundra mammoth through the well sewer entrance, you have a chance to get randomly pinned with this croc, since it randomly throws you through Dalaran. this is a reference to the REAL fact that when you flush a crocodile down the toilet it stays alive in the sewers. Fry: is it true that when you flush aligators down the toilet they stay alive in the sewers? interior crocodile aligator WoW version! Seems to have a very low chance of flying across the Dalaran Sewers map at the beginning of each arena match. Scared the $%^& out of me the first time I saw it. Isn't this a reference to Killer Croc's appearance in Arkham Asylum? This is a croc (albeit a literal one) that lives in a sewers, it moves suddenly from his place to the grate, just like Killer Croc suddenly appears behind the sewer door, and also threatens to eat you. The only differences are this croc being a real croc and the door being a grate.